The CGOA Board of Directors reluctantly accepted the resignation of board member Barbara Hillery van Elsen due to personal reasons. The Board has appointed Tammy Hildebrand to complete the remainder of Barbara’s term. Tammy is a long time member of CGOA, a Professional member and the Chair of the Professional Development Committee. Welcome to the Board, Tammy! NOTE FROM CGOA Board: The information posted below is correct. The information that appears in the latest issue of Chain Link in Crochet! magazine was sent to print before all the decisions about the two 2011 Chain Link conferences had been made. This correct information will be printed in the next issue of Chain Link. We apologize for any confusion. Thank you so much to the 2011 Design Competition Committee for all their hard work to bring us another excellent event! Join us in a celebration of crochet creativity like no other. 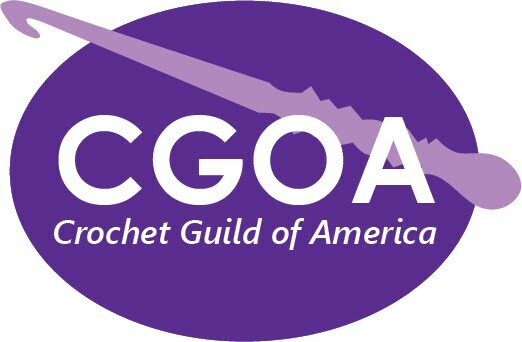 The CGOA 2011 Design Competition invites all CGOA members to help show the world the best that crochet can be. Whether your talents lie in dreaming up afghans, garments, doilies, bags, amigurimi, freeform or joyful artistic expression, there’s a design category to entice. And with thousands of dollars in cash prizes at stake, your entry can be richly rewarding. The Competition judging and Awards Ceremony will take place during the CGOA Conference in Greensboro, North Carolina, September 21-25, 2011. The Competition is open to CGOA members only, at all membership levels including General, Associate Professional, Professional and Corporate. Any design that is primarily crocheted, is the designer’s own original work, and has not been previously entered or published may be submitted. This year’s entry package is again electronic, and will be ready to roll in early January. Please visit the CGOA website at www.crochet.org or the CGOA Now blog at cgoanow.blogspot.com for official rules and the latest information and for the link to view, download and complete our new, electronically fillable (experimental!) entry form. The deadline for entries to be shipped to the receiving location is 31 August, 2011. You don’t have to attend the Greensboro event to participate or win, but you won’t want to miss the excitement on site as we unveil the awesome display of entries and announce the winners. So get those creative juices flowing and plan on being part of this singular event as we further the prestige, pursuit and recognition of crochet excellence. Calling all knitting & crochet designers! If you have a pattern or patterns that you would like to submit in our 2012 Pattern Calendar Contest, please click here. UPDATE: Due to a lack of high resolution images, we are opening the submission process up for additional patterns until November 20th, 2010. Also, please note that if you submit multiple patterns, your chances of winning increases and you will receive a FREE calendar for each pattern that is included in the 2012 calendar. If you received an e-mail from Christy asking for a new or higher resolution photo, please get that in ASAP! 2011 Contributors: Everyone should have received their calendar from last year by now. If you have not received yours, please contact me with your current mailing address and the name of the included pattern. It is VERY important to me that our contributors get their FREE calendars. Designer's retain ALL ownership and copyright to their patterns. New patterns are always appreciated, but patterns that you are currently selling on your website, blog or on social sites like ravelry.com are perfectly acceptable. You are simply granting us permission to print your pattern(s) in our calendar. If you have any questions, please don't hesitate to email me so I can answer them for you! Multiple submissions give you a better chance of winning the contest and you will receive a FREE calendar for EACH pattern that is included in the calendar. If you are interested in learning more about why designers submit their work to our calendar, click here.